The Hotel Yaramar is an impressive bright, modern hotel directly opposite Playa de los Boliches beach. The central crystal atrium greets you as you enter and the panoramic lifts will take you to your floor. For a variety of reasons we felt the need for a week of doing nothing but laying in the sun and the hotel certainty fulfilled our desire. Super location, friendly guests, good food. Perfect. We only went to a couple of the shows but they were adequate. I've seen a lot worse! Never had a problem finding a sunbed although I did wonder how some people could stay out all day in the very high temperature! Breakfast was good and only one evening meal was poor, the rest were fine. We found an 'English' café near the hotel and tended to buy a sandwich from them to eat on our balcony. Only grumble was the fact that although the hotel was supposed to have a dress code for the evening it was not adhered to. Is it really that difficult to make an effort? One night hubby was treated to the classic 'builder's bum' dress attire - not pleasant. I understand some people had complained so we didn't bother. We stayed in this hotel for 1 week from 18th to 25th March 2012. We couldn’t find fault with the food, staff, or anything about the hotel except the entertainment which was diabolical. Two of the singers were very good but the remaining two were poor although they were all very hard working. However there were 2 professional acts on in the week and these can only be described as average. On several nights we went to the sister hotel to watch their entertainment (Hotel Angela) and the acts there were very good. Would we use this hotel again? Yes, but hopefully by then the entertainment will have improved. The Yaramar Hotel is an excellent hotel and staff brilliant and friendly. Great for either a relaxing holiday or you can join in the day or evening entertainment. The outside pool and Jacuzzi were very clean and a nice place to laze around for the day. Our room did look a little tired but clean nonetheless, the window pelmet fell down during the night, a bit frightening for me as it was in the middle of the night and it fell with a loud bang. The only disappointment was that we felt that it petty to ask your guests to pay for the hire for the use of the fridge, shame, a bit of a let-down really. This should be free to enhance your stay at the hotel, not much to ask really. We have just come back from staying here a week hotel was very clean. The food was terrible from bacon that was very burned to eggs that were still slimey on top, and as for the evening meal I have had better in a truck stop. The meat wasn’t sliced it was cut into chunks and it was still tough as for desserts the little cakes with the cream in the centre my partner tried to cut it and it was solid in the inside he even had trouble using a knife and fork it was so hard. As for entertainment it was far better in the Angela hotel, the sister hotel, this I would not rate as a 4 star it would be lucky if I rated it a 2or 3. We stayed at this lovely clean hotel at the end of August for 2 weeks. On arrival we were shown to our standard 3rd floor room which was overlooking the pool and beach. We thought it was a good size with twin beds, TV showing English channels, safe, tea and coffee making facilities and fridge (16 euros a week to hire) pool towels already in room. Powerful shower over bath with a shower mat. Loved the lifts, very posh. Large enough to take a wheelchair comfortably and they even had air conditioning; They struggled to cope at mealtimes though. Quicker to take the stairs although if you were on the top floor this would not be an option really. Food at this hotel was very good. Always hot and plentiful, the plates were very hot! Good toasters! Porridge and the usual full English breakfast every day as well as cereal, fruit, eggs cooked in front of you if you wanted omelets etc. Dinner was also good lots of choice. Never had a problem finding something we liked. The puddings became a bit samey after a while but still OK. We tried to get down to dinner early each evening as left until later you had to queue for a table. Drink prices were not too bad especially in happy hour. Pint of Lager was 3.20 coffee 2 Euros. All served to your table with a smile and little bowls of crisps and nuts. The staffs were superb. Very helpful and friendly especially at reception and in the restaurant areas. The thing we felt that let this hotel down was the evening entertainment. Unless you like old time dancing then this could be for you, Downstairs in the basement is where the main acts were and over our 2 week stay we saw maybe just 3 good shows, the rest were the typical reps and awful. You couldn't see the stage in the smoking area but you could watch the shows as they had a video link to a large screen. For smokers there is a bar called the Churchill although it is not staffed and very little used, people either didn't know about it or preferred to go outside for their ciggies. The hotel has a good swimming pool and bar area but for some reason they close it around 6pm or so. Didn't use the pool sunbeds often as we preferred the beach but looked OK. Noticed there was the usual rush when the doors opened at around 9am. Opposite the hotel is the Rivera beach club and as guests of the Yaramar you can have two beds and a sunshade with a sangria each for 5 Euros. They had thick mattress on them too! It was easy to just pop back to the hotel from your sun bed to have a drink, go to your room or use the toilets in reception if you don't fancy using the ones on the beach. To sum up we enjoyed our stay and would return. A very good holiday. Myself, husband and two sons (17yrs and 20yrs) stayed at the Hotel Yaramar in August 2010 for two weeks and had a lovely time. The only complaint we have about this hotel was the air conditioning could have been turned up higher, as it was very hot. The Thompson Gold reps (Harry, Dolly, Emily and Colin) are very good and work very hard to at helping the guests have a lovely holiday. The food, staff, cleanliness, etc, in the hotel is very good. One night I dropped my fork in the restaurant, and the waitress brought me a clean a clean one before the fork I'd dropped had hit the floor! The rooms are lovely and clean, and the chambermaid was very friendly and chatty, and kept our bedroom very clean. The hotel has Happy Hour in the bars, which is great! Unfortunately my two sons had their wallets and mobile phones stolen on the beach. Partly their fault though, as they were skinny dipping in the sea one night with two girls and left their items unattended. When they came out the sea, their shorts pockets were empty. More alarming, both my boys got beaten up on the second week by four foreign boys/men about 25yrs in an unprovoked attack. The doctor in the hotel Yaramar came to see the boys in their room and sent them to the hospital in Benalmadena for stitches and x-rays. We were told nothing was broken, but after x-rays in Cheltenham hospital, it shows my sons cheek bone is actually broken and needs an operation tomorrow to fix it. A bit baffling why this wasn't picked up in the Benalmadena hospital. My sons had to spend the rest of the holiday with two black eyes each and swollen faces, but staff and guests were always asking after them. We went on some lovely day trips from Fuengirola. The Fuengirola Bioparc (Zoo) is very good, although a little expensive. The cable cars in Benalmadena are excellent (catch a bus to Benalmadena, then another bus to the cable cars), well worth a trip. We had a lovely day in Ronda, which is a beautiful place to visit. We also had a lovely day in Gibraltar seeing the apes on the Rock, and the WW2 tunnels are very interesting. Mijas is a quaint place to visit. I have to agree with previous comments about most guests in this hotel are older (50yrs+), but what's wrong with that?! The pool area is very clean, as is the pool and jacuzzi. People do queue for a sun bed, but we never had a problem getting one. Would we return to this hotel? 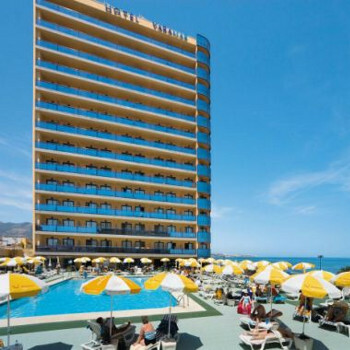 Yes if it was else where, but sadly we didn't like the resort of Fuengirola and that's the reason why we wouldn't return to the hotel Yaramar. This Hotel is nice; the service is first class, the people who work there are friendly. But as the Brits aren't filling the place the hotel will fill the rooms with Spaniards who take children with them. We were sprayed with water pistols bumped with floats by children running about. People who keep going back year after year have never seen children there before. A complaint to the girl rep was; she opened the drawer of her desk and pulled out the brochure with the relevant page opened and the small print highlighted which makes the whole brochure about exclusively for adults pointless. She said you must have signed or ticked that you agree with the terms and conditions. Would I go back, maybe when the recessions over till then give it a miss. This is not as advertised and it’s adult only. Stayed at the Yarama Hotel Fangirola (gods waiting room)Pleasant enough place, with a central auditorium, which meant that the entertainmant in the bar could be heard as if it was being played in your room up until 23:59 every night. Come Dancing every night, but probably could be compared more with the worst of Britain's got Tallent. Only go if you have a medical history to relate. Pool area always full, but generally very clean. Understaffed in the restaurant, always a queue to be seated, food abundant, but tended to be dried out as it was left under the heat lamps for too long. This was a general view from the people who had been there for mosty of their holidays. Entertainment was singing of old songs, only spent two nights there as the room did not lend itself to entertainment being an "L" shape and open to smokers. Food was plentyful,lots of choice chef's always topping the food counters up. All parts of the hotel were very clean,towels changed daily pool towels also supplied,sheets changed twice. Hotel in a flat area beach over the road,train station2streets from the hotel very easy to get around even for the less mobile. All members of staff were very nice nothing was to much trouble for them we were given a room on the 15th floor to high for me but within 5minutes we were given a room on the 5th floor. The entertainment was run by the Thomson gold team they were very good and they work hard,they do the daytime plus evening. They are down stairs some reviews say it gets smokey there but it was'nt when we were there,smokers had a big screen to watch the show as some parts of the area were off angle but if you dont smoke then you are round the corner facing the stage plenty of places to sit. We would visit again no problems at all,but we did hear that someone had money stolen when they were on the beach and another lady had 200euro pinched from her bag at the local market. With hotel over the road from the beach really there was no need to take money with you as its easy just to pop back to your room for it,that's what we did we also used hotel towels which are supplied for you so we had nothing to worry about if they did go missing,these things can happen anywhere,we done the market we never had or seen anything bad. There was a mix of age's when we were at the hotel we are in our 40's but there were younger ones some being in there 20's. Wonderful hotel, absolutely faultless. Hotel clean, everyone friendly, food varied, plentiful and tasty! If I were to pick one fault it would be the evening entertainment as the room is situated under the hotel, which seems a little strange as it smelt a little stale. However, there is so much to do in and around the hotel that in our 2 week stay, we only watched the Thomson entertainment two or three nights. We were so pleased with our first stay, we are going again this year (infact, my parents both went in April for a short stay too)! Would definately recommend the Yaramar! P.s - I thought I had left a review before, but obviously not!